The kids and I headed down to Texas–AKA God’s country?–for Christmas and thanks to Toyota we cruised around the state in a 2017 Toyota Sienna. I must confess: a minivan is my daily driver, so I was super bummed about spending our vacation in a minivan. Unlike many moms I do not embrace the minivan life. I drive a minivan because at one point I had three kids in car seats and sadly for me, a minivan is a fabulous option when you have three or more car seats. However, on this trip I was going to be road tripping over 1,000 miles with my three kids, plus my sister, niece, and my mom. Since I needed a vehicle that would seat 7 it was either a minivan or an old school church van. Definitely not an option. Families with multiple kids in car seats. Families with quintuplets–room for 5 car seats! This van is not cheap. 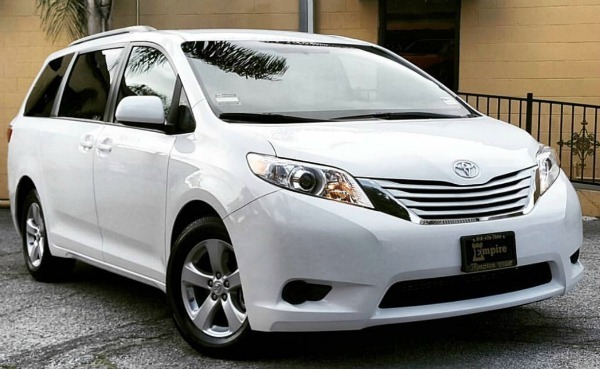 I drove the Toyota Sienna LTD Premium AWD (all wheel drive) which was priced at $51,244. It’s hard to think of spending that kind of money on a minivan, except I sure do wish my minivan had AWD. Since we are now into a new model year I decided to see if the price had dropped any. I looked up priced in my area for the model I drove and it suggested $42,314 – $44,804, quite a bit lower than MSRP. The starting price however is a much more affordable $29,750. There are 8 versions of this minivan available, including a V6 option! In case you were wondering about resale, I looked that up too and discovered that this minivan won the 2017 Kelley Blue Book Best Resale Value award. It’s too early to tell what the current model year will sell for in three years, but that’s good to know. Cargo Space – Between the seven of us, we had 7 suitcases, all of which fit into the back easily. 3rd row folds flat – The 3rd row can fold down into the bottom of the cargo area and give you a flat area to haul stuff. Two sunroofs – one up front and one in the back. Shaded windows in the middle row. It’s low to the ground, making it incredibly easy for kids to climb in and out. There’s an infotainment center with a Blue Ray DVD player and 4 sets of headphones. The layout of the front. Everything is easy for the driver. They tour that with one motion you can drop the back seats into the cargo area. That may be true, but it took two of us to get those seats back out and set up. If I had not had help I could not have managed it. Unlike the 2015 Sienna the kids and I tested a few years ago, this one does not have the foot rests on the middle row captain’s chairs. It’s really too bad, as this was our favorite feature. Disclosure: The Sienna was provided to me by Toyota for the purpose of review. All opinions expressed are my own. Fun and completely useless fact: I drove the Sienna to meet my newest cousin baby Sienna. Isn’t she cute! Now you might be wondering what we listened to during our 1000K mile road trip. My sister and I are children of the 90’s, so it was all 90’s all the time. Here is my 90’s playlist, so you too can listen to hits from the 90’s! Meagan is the Director of Social Engagement and a contributing writer. Meagan is a travel writer based in Portland, Oregon with her three children. Founder of www.MommyTravels.net, Meagan has been a social media influencer and blogger since 2008.